Andy Warhol was a man of the future. This is evident in his Moonwalk portfolio. A set of 160 limited edition screen prints, these images capture the 1969 Moonwalk as see through the eyes of the ultimate in cool: Adny Warhol. Warhol’s Moonwalk explores the overlapping boundaries of time. The translucent colors capture your gaze in classic Warhol fashion. No other artist can transform man’s first steps not he moon, and turn it into a screenshot from a movie. Warhol created the Moonwalk Portfolio to commemorate the momentous achievement of the first man on the moon. He aptures the magic, drama, and fantasy of the moon walk. He know what the people want and sells it by making the unknown voyage cool. 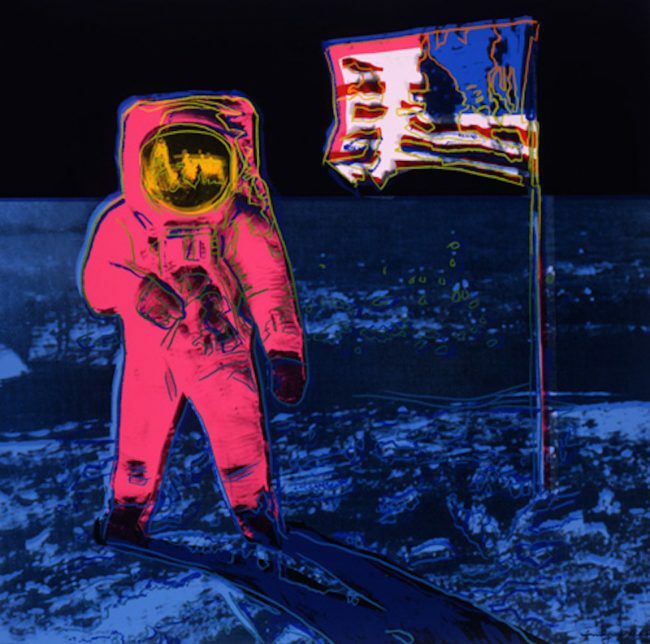 Warhol’s Moonwalk depicts Neil Armstrong’s photograph of Edwin “Buzz” Aldrin, Jr. walking on the moon for the first time in 1969 during the Apollo 11 mission. Moonwalk is a portfolio of only two prints. In this specific print, Warhol chooses to color the astronaut in yellow. The American flag has similar coloring with blue, reds, and pinks. He uses this color scheme to embellish the primarily dimmer and darker colors of the background. Warhol created the Moonwalk Portfolio to commemorate the momentous achievement of the first man on the moon. He aptures the magic, drama, and fantasy of the moon walk. He know what the people want and sells it by making the unknown voyage cool.The Moonwalk images by Andy Warhol were created in 1987 only months before his death. Like any other great artist Andy was looking to the future. By using this landmark moment in history as the focus of his art work, he preserves the emotion that everyone felt as one Neil took “one small step for man, one giant leap for mankind”.